January 2017 ENSO update: Happy New Year! It looks like La Niña is on her way out, and neutral conditions are expected to take over by next month. While she’s still hanging around, let’s take a tour around the world in 80 lines (or so). The engine of ENSO (El Niño/Southern Oscillation, the whole El Niño & La Niña cycle) is the temperature of the ocean surface in the equatorial central and eastern Pacific. 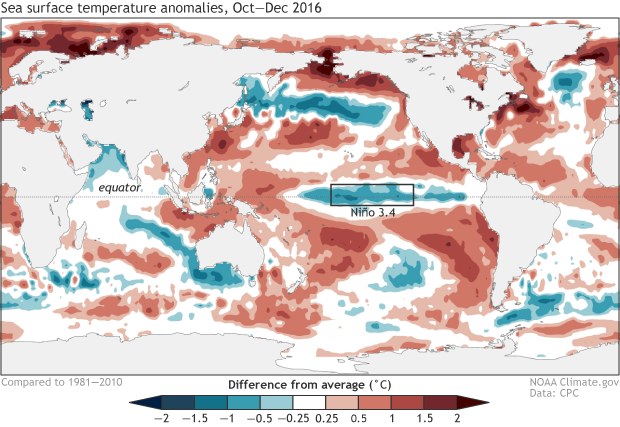 Since late summer 2016, the Niño3.4 region has been cooler than the long-term average. December was -0.72°C below average, a slight uptick relative to the month before. Monthly sea surface temperature in the Niño 3.4 region of the tropical Pacific compared to the long-term average for all years starting off from moderate-to-strong El Niño since 1950, showing how 2016 (blue line) compares to other events. Climate.gov graph based on ERSSTv4 temperature data. As I’m sure you’ll recall, we assess ENSO on seasonal timescales, meaning the average over several months. The average for the October – December period was -0.8°C, so we now have four successive three-month periods with an average cooler than the La Niña threshold of -0.5°C. Five successive seasons are required to officially qualify as a La Niña event. Forecasters are confident that the November – January period will qualify as continuing the La Niña, but predict that the next period, December – February, will be warmer, and likely end up in neutral territory (between -0.5°C and +0.5°C). Nearly all of our computer models forecast this upward trend in the sea surface temperatures, giving confidence to the prediction that our weak La Niña is nearing its end. The store of cooler-than-average water below the surface has dissipated, too. 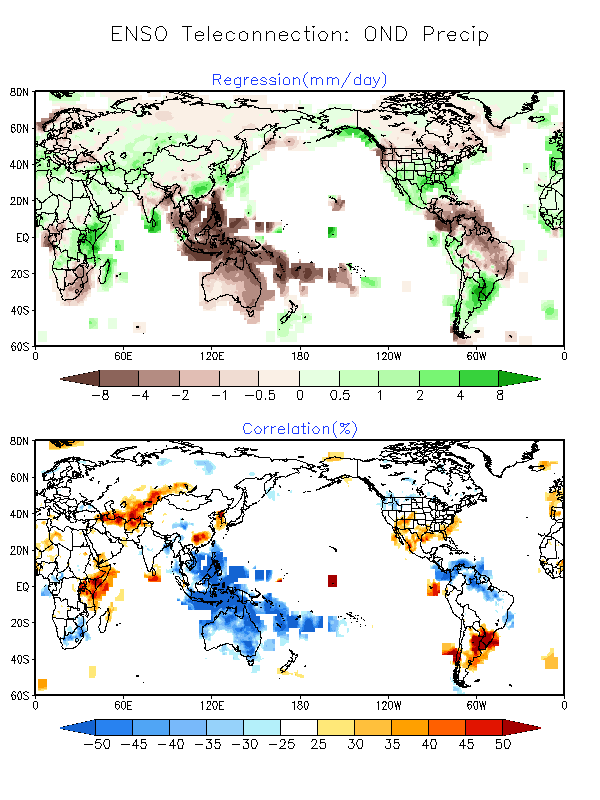 There were still consistent signs in December of a weak atmospheric response to the cooler equatorial ocean, with reduced cloudiness and rain over the tropical central Pacific, and more over Indonesia. La Niña conditions mean the wind circulation in the tropical Pacific (east-to-west in the lower atmosphere, and west-to-east in the upper atmosphere) is stronger than average, an effect we also saw during December. Taking a look at the global ocean map, you can see the small patch of cooler waters that is powering our La Niña is still embedded in a very warm (compared to average) Pacific Ocean. To the north, you can see a horseshoe pattern that resembles the positive phase of the Pacific Decadal Oscillation (PDO). Because ENSO can impact sea surface temperatures across the North Pacific Ocean, a positive (warm phase) PDO during La Niña is less common than a negative (cold phase) PDO during La Niña (though, during August-October 2016, the PDO was slightly negative). Average sea surface temperature during October – December 2016, shown as departure from the long-term (1981-2010) average. Climate.gov figure from CPC data. 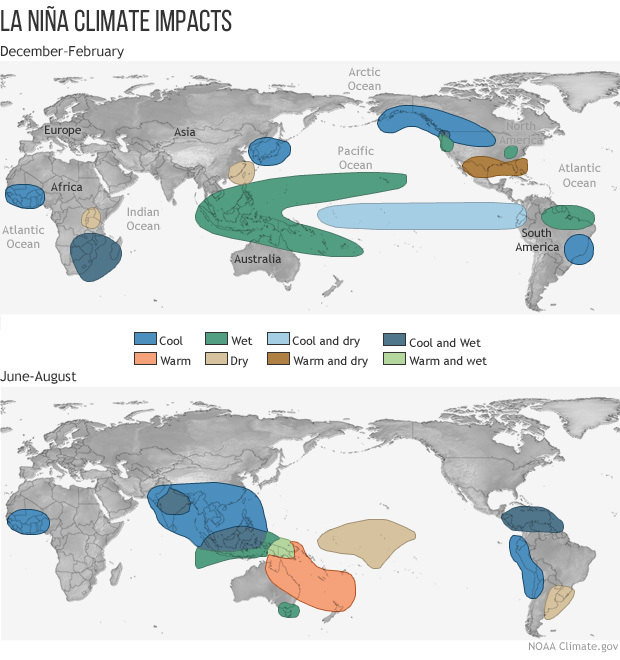 Has this La Niña affected global weather and climate over the past few months? It’s very tough to point to any one weather or climate event and say “that was due to La Niña!” (In our business, the process of identifying the causes of certain events is called attribution.) There are a lot of different, complex things going on in the atmosphere at any one time, interacting and affecting each other. It’s like trying to identify exactly which sneeze is due to the head cold you have, or to a random bit of dust floating through the air. However, we can look at overall patterns and get a lot of information. If you’re sneezing a lot more than average, that pattern is probably due to the head cold. Likewise, we have expected outcomes during El Niño and La Niña, and we can look at the global maps to see how much the observed patterns resembled the expected. 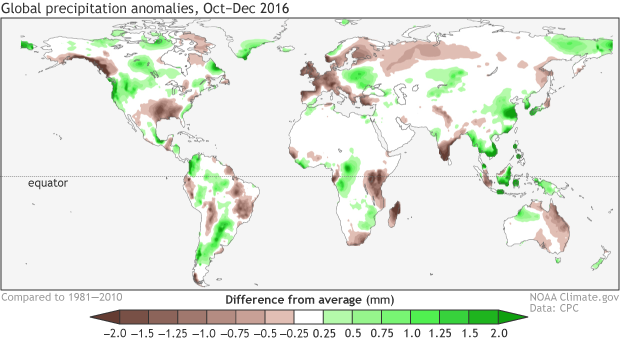 October – December 2016 rain and snow patterns, shown as the difference from the long-term mean. Climate.gov figure from CPC data. This past October – December’s precipitation over North America looked quite a lot like the expected La Niña effect: drier over Alaska’s southern coast and panhandle, wet in the Pacific Northwest, and drier than average across much of the Southeast. October – December 2016 surface temperature patterns, shown as the difference from the long-term mean. Climate.gov figure from CPC data. Most maps of global temperatures are warmer than average these days, as temperatures trend upwards with global warming. Of course, it’s not warmer everywhere, all the time, because of all that complexity I mentioned earlier. 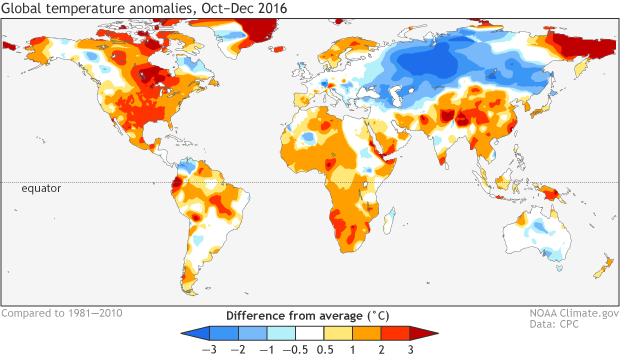 The October – December 2016 temperature map has a lot of warmer-than-average colors, with some colder areas over northern Asia. ENSO relationships with temperature are not as strong as they are with precipitation, especially during the fall. 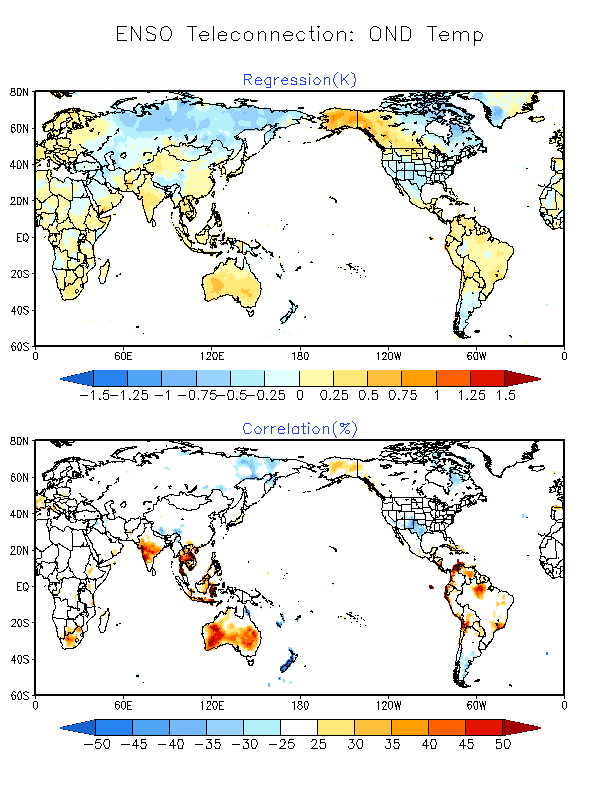 Northern Asia can be warmer than average during La Niña—opposite of what was observed this past fall—but this is a weak relationship, easily overwhelmed by other climate variability. Another La Niña tendency is a continental pattern over North America of cooler northwest/warmer south. This showed up a bit, with the northwest being not actually cool, but somewhat less warmer-than-average. Hey, it’s a warm world. You may have noticed that some of the long-range computer model forecasts appear to be wandering back up into El Niño territory for the second half of this year. We’re not placing a lot of confidence in these forecasts and are favoring ENSO-neutral (~50% chance during August-October 2017), but the remaining odds are not evenly split: we are tilting the odds toward El Niño (~35% chance) over La Niña (15% chance). Forecasts of ENSO made in the winter and early spring have historically not been very skillful (the “spring predictability barrier”). Also, there are no strong signs right now giving us a good picture of what the summer and fall will look like. A three-year series of El Niño/La Niña/El Niño has only happened once since 1950, in 1963/1964/1965. This doesn’t make it impossible that El Niño could develop, but it means that we aren’t counting on it. One thing you can count on is that we’ll be watching all the ENSO indicators, and keeping you posted on all things ENSO! I sure hope you're able to keep up this blog after the dreaded January 20 has come and gone. Thanks! We agree that ENSO is a nice example of how weather intersects with climate. I am looking at the recent trends in the SST anomalies, and it's looking like El Niño may come back again possibly towards the end of the year. 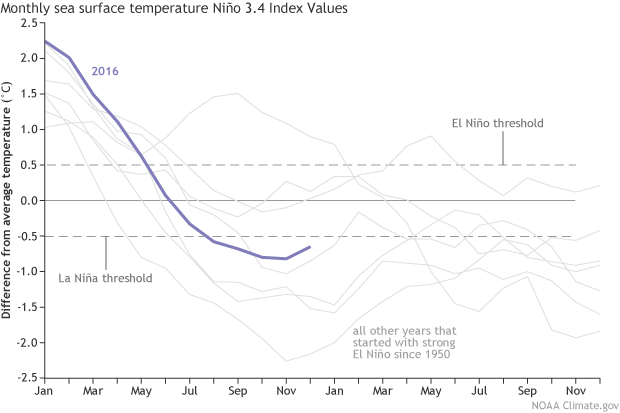 It feels unusual given how strong the recent 2014-16 El Niño event was. Hi-- as Emily pointed out, there is some tilt in the odds toward El Nino during later 2017. We're not favoring this outcome at this point b/c we still have yet to get through the spring barrier when predictions are lower in skill. So right now, we favor ENSO-neutral, but certainly, we need to keep our eyes on the tropical Pacific Ocean for signs we could go back into an El Nino (or even a La Nina!). Thanks Emily! I've enjoyed reading about La Nina and El Nino. Fingers crossed this cycle ends soon. Montana had more than its share of -16 temps this winter. I wonder, is there a significant amount of data taken of ocean floor water temps in the Pacific Ocean(or any ocean) over the last 70 years or so? Hola, alguien puede decirme dónde encuentro la pluma del Niño 1.2 prevista hasta el 2020? ?